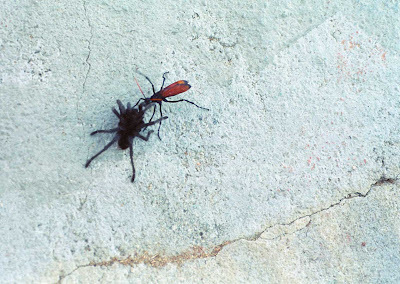 The Tarantula Hawk is a wasp that lives in the desert areas around us. It got its name because the wasp finds a tarantula and stings it which paralyzes the spider and allows the wasp to lay its eggs inside or on top of the tarantula. The eggs hatch and eat the spider and then the whole cycle begins again. I think Nat Geo has some footage of this process in their In the Womb series. The wasps rarely attack humans and are the coolest looking flying insects we have around here with their bright orange colored wings and humongous black body. If they do sting you though I hear it's like getting shocked, the abdomen on them is massive compared to all other wasps and bees. I shot this pic a few years back in the West Valley. The wasp was dragging the paralyzed tarantula up a ditch that we used to skate a lot. I usually start to see them around this time of year but even more so in the Fall. I remember one time in late Summer or early Fall when I was hanging at my friend Nick's house on the top of Woolsey Canyon when I saw a whole swarm of little tarantula wasps fly by.